Having left over cranberry sauce from this year's Thanksgiving, I wondered how I could make use of it. Tina suggested that I make a pie, so I came up with a simple and easy way to make leftover cranberry sauce into a treat. 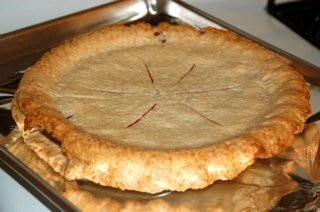 In this article, I not only test my new recipe, but also test the new Trader Joe's Pie Crust. 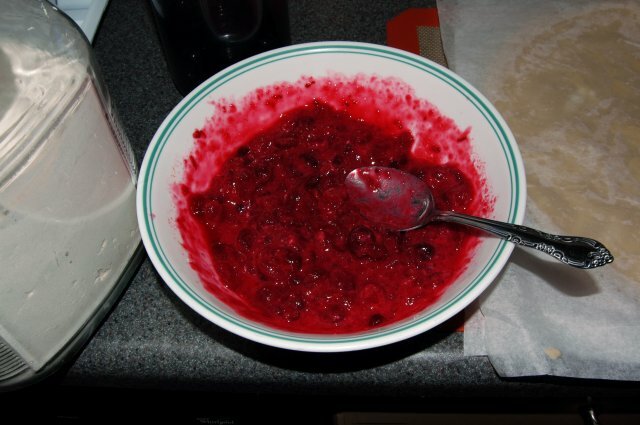 Fresh cranberry sauce is best used within seven days of preparation, but can be frozen for longer periods of time. If you're not making this recipe from leftovers, just prepare Cranberry Sauce after lining the pie pan with pie dough. Since I was preparing this pie on a weeknight, I decided to try a new pie dough product from Trader Joe's. 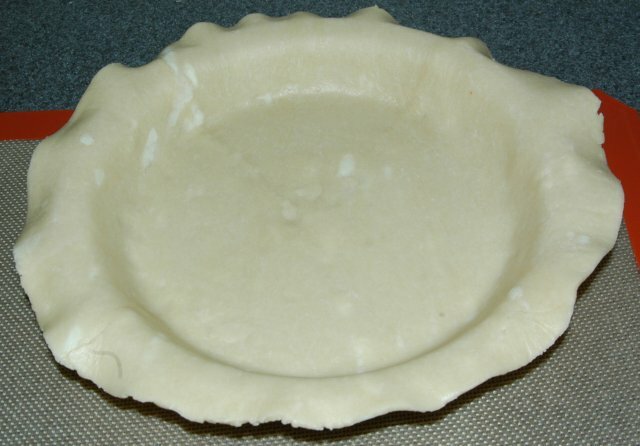 The pie crust costs $3.50 and is a butter only crust (no vegetable shortening) which means it is free of trans fats. A definite bonus in my book. The box contains two pie crusts, each a bit larger than 9 in. (23 cm). I brought them out of the refrigerator to bring them up to room temperature for each molding. Once the crusts softened up a little, I unfolded them and fixed any holes that formed due to cracking at the folds. I then draped the crust over my 9 in. Pyrex pie plate. 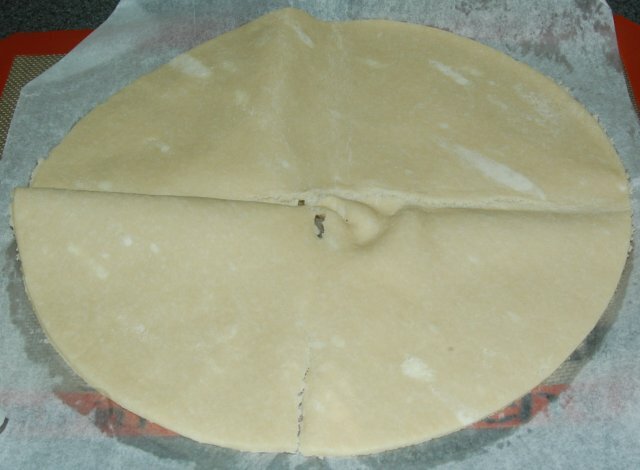 When making pie doughs, usually you roll the dough onto a large rolling pin to transfer to a pie plate. The crust is then rolled off the pin onto the plate. Because the Trader Joe's dough was packaged in paper, I was able to simply take the paper with the dough and flip it onto the plate. Simple. I gently pressed the dough down into the pie plate until it fit snuggly. I then slipped it into the refrigerator as I preheated my oven to 450°F, unfolded the other piece of dough, and healed the cracks. I took the leftover cranberry sauce and mixed in one tablespoon all-purpose flour. This will provide enough thickening agent into the sauce to let it set as a filling. In my case, I had only about two cups of sauce left, but more or less sauce will also work. You want to adjust the flour content accordingly to ensure the filling will set up. I then retrieved the pie plate from the fridge and poured the sauce in, using a spoon to smooth it out. I then laid the other pie crust on top to form a double crust pie. I then trimmed off the excess dough around the pie plate. Leave about 1/2 in. (1.3 cm) of dough around the plate. If your plate has a lip, then you can just trim to the edge of the lip. 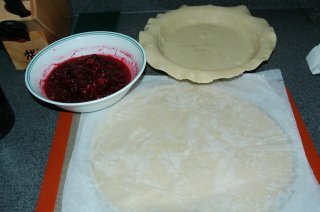 In my case, I wasn't paying attention and did not trim off enough, resulting in a less than perfect looking pie crust. Starting at a random point, I fold the top dough edge over the bottom and crimped. I continued to crimp all the way around the edge to seal the crusts together. Then I fluted the edge but pressing the dough between the side of the index finger (pointing finger) of one hand and the thumb and index finger of the other hand. The lone index finger should be on the inside edge, while the other hand presses from the outside edge. 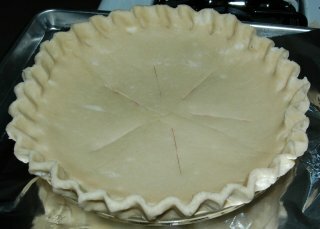 Once the edge was fluted, I used a sharp knife to cut a few slits into the top crust to allow steam to vent from the pie as it bakes. The pie plate was then placed on a sheet pan (to contain any spills or bubble overs) and placed on a center rack. I baked for 10 min. at 450°F and then reduced the temperature to 350°F. After 30 minutes, the pie was done. 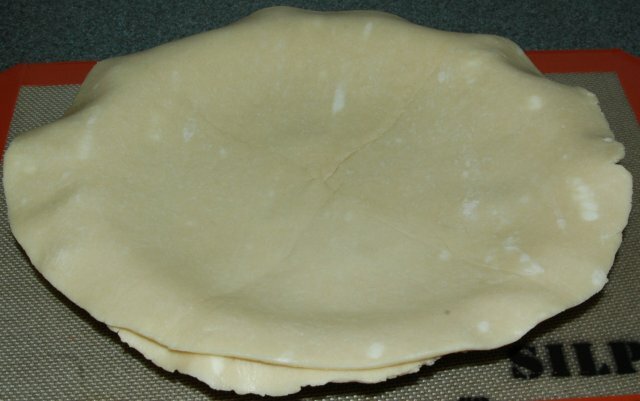 As you can see, if you have excess pie crust (not enough is trimmed off), then the fluted edge is unable to sustain its weight as it bakes and droops down. Other than it's flawed look, this pie turned out to be quite delicious. In fact, so good that Tina reserved several pieces before letting me take it to work. (Usually, she only has one slice.) My coworkers were quite happy with the result as well. In general I felt that the pie crust was not one of the best that I've tasted. It was definitely flavorful (because of the butter content), but not flaky. As one taster mentioned, it had a "cookie or cracker consistency". Is the crust worth $3.50? I'm not so sure. It's convenient and probably one of the better grocery store crusts you can buy, but a homemade crust is definitely worth the extra effort. Oh, since this article is all about consuming leftovers, what did I do with the trimmings from the pie dough? I cut them into finger sized strips and rolled them in granulated sugar and threw them in the oven (on a sheet pan) for 45 minutes to bake with residual heat after I took out the pie. (I keep a pizza stone in my oven, so the temperature stays up for quite a while. If you don't use a stone, just keep the oven on for an extra twenty minutes.) The baked crust strips make nice "sugar" cookies. 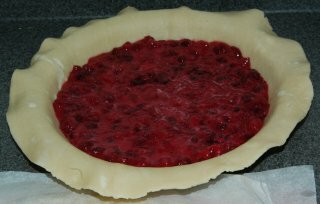 Leftover cranberry sauce mix pour cover crimp & flute bake 450°F (230°C) 10 min. bake 350°F (175°C) 30 min. 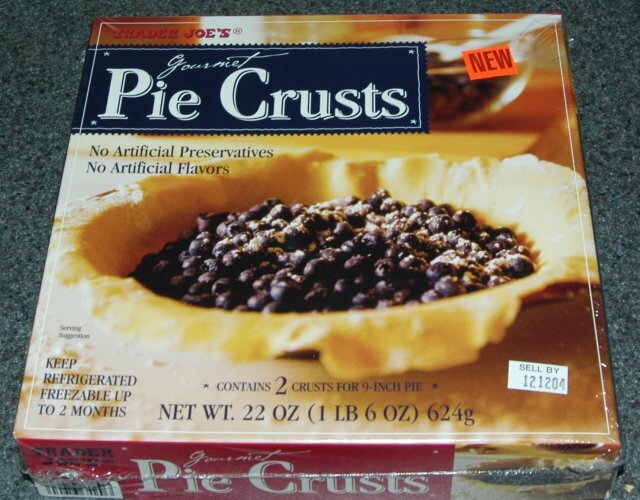 I saw the TJ pie crust yesterday in the store where I live and when I read the indgredients I thought it was all-butter, too, until I took a more careful look. The one I was looking at had palm oils in it. Same product, or do they vary by market (I'm on the East Coast)? Since it's been a full three years since I posted that recipe, I made a trip out to Trader Joe's today to check on the ingredients on the pie crust. My TJ's sells a product that has butter and palm oil as well, so I do not think the product varies by geography. As to whether or not it contained palm oil in 2004, well... I can't say for sure, but I certainly believed at the time that it was butter only. I dug up the original photo set for this recipe and, unfortunately, I never took a picture of the back of the box. However, the front is the same including the UPC code (I don't know if the UPC code changes if a product's formulation changes slightly... probably not). There's only one thing to do and it's to find some time to bake a pie to see if the crust is flakier than I remember. If so, then the palm oil is probably new. 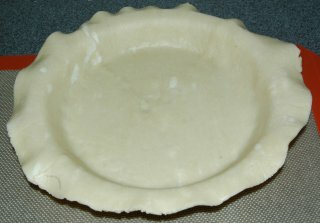 An "all butter" pie crust, whether homemade or not, will differ from one made with a butter/shortening or butter/lard combo in a major way as far as the "flakiness" factor goes. Have a suggestion for you on how to use up leftover pie crust dough. 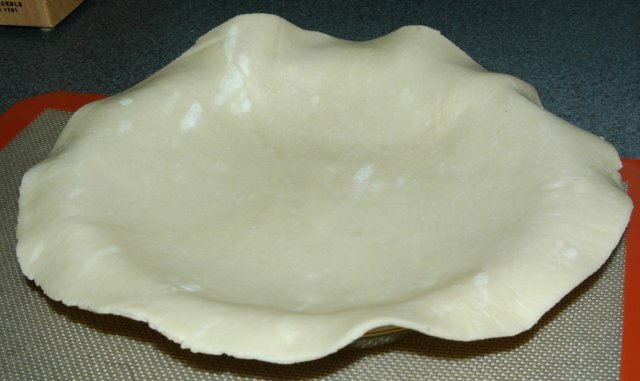 This is how my mother used up her pie crust dough when we were growing up. Roll all the leftover scraps into a (more or less) rectangular shape. Spread lightly with softened butter or margarine. Sprinkle liberally with sugar and cinnamon. Starting at the longer side roll like a jellyroll and cut into 1/2" pieces. Place on greased pan. Bake at 350F until crust is golden, about 20-25 minutes.